What is the SureSmile® Process? SureSmile® precision braces by Dr. Kenneth Grabowski Orthodontics are designed with advanced technology to move your teeth more precisely than ever before. After your SureSmile® wire is inserted, you’ll be on your way to a beautiful, healthy smile sooner than you thought possible. SureSmile® creates a 3-D computer model of your bite by using advanced imaging technology to scan your teeth. The 3-D image can be captured with the OraScanner® or Cone Beam Computed Tomography (CBCT). The scan procedure is the beginning of your SureSmile® treatment. With the 3-D model, the doctor can now see your teeth from any angle and how they fit together. 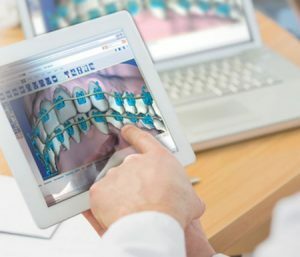 SureSmile® Treatment Planning software provides virtual simulation tools that allow Dr. Grabowski to determine the final position of your teeth and the most effective plan for your unique treatment needs. Once your treatment plan is determined, SureSmile® directs a robot to bend a shape memory alloy archwire according to Dr. Grabowski’s prescription. This wire is designed to deliver gentle forces needed to move your teeth consistently and more directly to their desired finishing position. Conebeam Computed Tomography scans allow the doctor to better analyze the orientation and position of your teeth and roots by showing the detail between different tissue types such as bone, teeth, nerves and soft tissue. SureSmile® software provides virtual simulations for your doctor to review planning options and determine your optimum treatment. The target position of each tooth is planned in advance so you’ll know what outcome to expect. Shape Memory Alloy archwires are made by heating Copper Ni-Ti™ metal to more than 1000ºF during the robotic customization process. These “smart” wires permanently retain your individual prescription and are activated by your own body heat. Ready to discover your perfect smile? Contact us today or request an appointment! © 2011 OraMetrix, Inc. All rights reserved. SureSmile® and OraScanner® are registered trademarks of OraMetrix. Copper Ni-Ti is a registered trademark of Ormco Corporation. Ready to meet the doctor and make your first appointment? We look forward to meeting you! I love playing video games while I wait for my turn, especially arcade games.